…for your drama club or drama camp’s next production! Little Women: The Strength of Sisters. 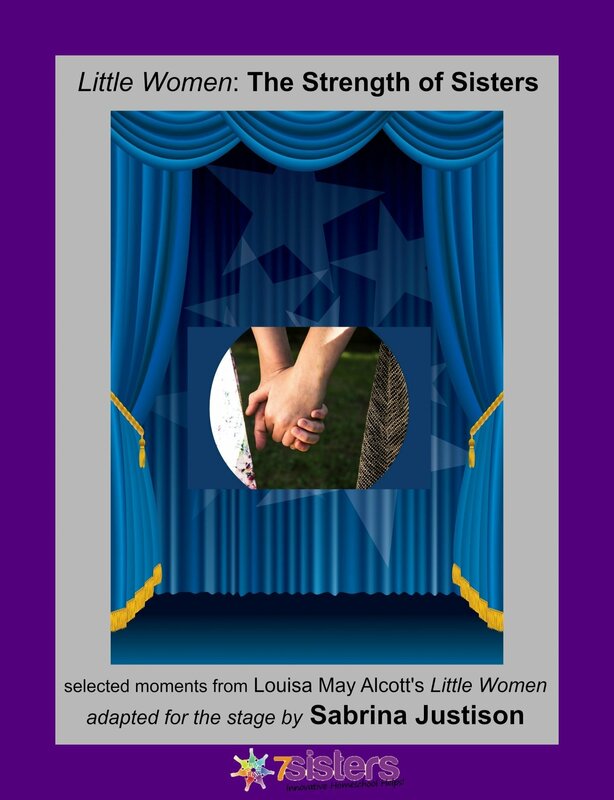 Share the joy and struggles of these beloved characters in this 1-hour play, selected from moments in Little Women by Louisa May Alcott, adapted for the stage by Sabrina Justison. Louisa May Alcott’s beloved novel Little Women, published in 1868 and now in the public domain, follows the lives of four sisters, Meg, Jo, Beth and Amy March as they grow from girls into young ladies during the Civil War. Their father is away serving as a chaplain in the army, and their beloved Mother, “Marmee,” oversees their humble, love-filled home. Little Women: The Strength of Sisters focuses on several pivotal moments in the early part of the March girls’ story. Jo longs to be a published author and struggles to control her temper; Meg cares for her sisters in their home but is almost mature enough to have a home of her own; Beth’s generous nature compromises her fragile health when she is exposed to Scarlet Fever while tending a poor family; Amy wants so much to be as grown-up as her older sisters that she sometimes acts like a spoiled child in spite of the good heart that lies beneath her immaturity. We all experience these struggles, and seeing the March girls persevere will give every member of the cast and audience hope and encouragement. Purchase of this PRODUCTION PERMISSIONS copy of the script allows the purchaser to make all copies necessary for cast and crew in your production. All performance rights for your cast are included in the purchase price of $24.99, and no royalties are due regardless of how many performances you schedule, provided you DO NOT CHARGE ADMISSION to your audience. You may take up a free-will offering, but you may not charge a set price for tickets without written permission from 7 Sisters – use the Contact Us tab above if you would like to request permission to charge for admission.